The work of William and Sascha Kooienga of Beechhollow Studios, Alf Sharp, Daryl Fisher, Bob Stancil, Skip Ritter, Jerry Gabriel and Richard Gentry will be on display and for sale in the Berger Gallery at the Arts Center. See how each interprets and interacts with wood. From sculpture, to furniture, to turned objects: a wide range of work will be on exhibit. Utilizing a variety of woods, craft methods, and finishes there is something to delight everyone's eye. All of the artists live and create in Middle-Tennessee. five are from Cannon County, one from DeKalb and one from Putnam. This is the first time all these makers will be exhibited (and on sale) together at the Arts Center. 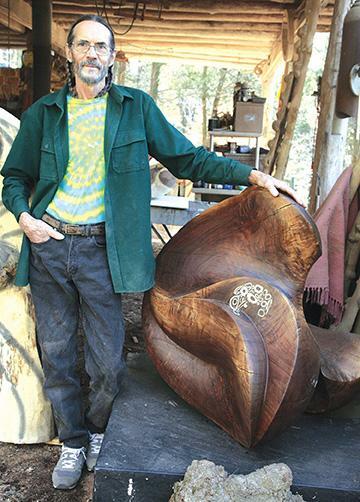 All of these artists take custom orders - from wood platters to museum quality furniture to public statuary. Consider the work in the show and know that each woodworker can be contacted to create a unique piece for your setting. The exhibit closes Saturday, Feb. 28. The Arts Center is open Tuesday through Saturday 10am to 4pm. Contact Neal Appelbaum for additional information. 615-563-arts(2787).